Maximize your results with mindful effort. LeeAnn Mallorie, Helping successful people come back to life. ThriveGlobal Facilitator. CEO, Leading in Motion. Embodiment. Mindfulness. Leadership. Your daily practices dictate your long-term results. 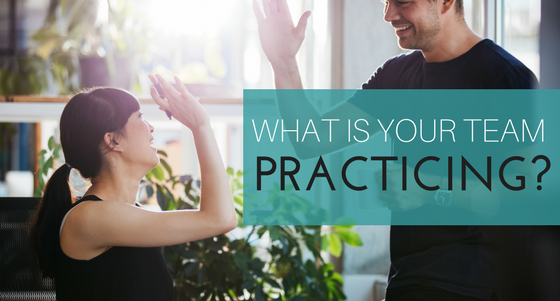 What are you practicing? Maximize your results with minimal — but mindful — effort. Each and every one of us-from corporate executive to aspiring artist-experience life in a physical human body. We take actions in this body. We make mistakes in this body. We learn new things in this body. And we develop habits in this body. In my early days training embodied leadership coach at the Strozzi Institute, I learned this lesson early on: we are what we practice… and we are always practicing something. In every moment, whether we’re conscious of it or not, we are practicing the moves that, once ingrained, we will continue to manifest again, and again and again. Sometimes we may even feel that our bodies have betrayed us. Our backs ache. We feel stressed or exhausted. And, if we’re conscious enough to notice our role in this frustrating dance, we might wonder what it would take to make a change. The truth is… it ain’t easy. And, it’s totally possible. For example: in 2005 when I took my first corporate-facing job, I found myself quickly burning out. In our office, we sat at our desks and sat in meetings all day long. Nobody took breaks. Nobody even took lunch. And nobody took note, even when their bodies were screaming for attention. Complicate this with my own personal practice-wired for perfectionism and driven to be the best, I found myself running hard to keep up, even as my physical energy depleted. Yet there was also a voice of sanity inside whispering…” just once a week.” If I could get out of the office, take a movement class, take a walk, go for a hike… something! Then I could start to feel whole again. And I want to challenge you to do the same. Eventually I asked for permission to leave work to take a one-hour fitness class across the street from our office. Soon, my colleagues began to follow suit. Within a year, the culture of our organization shifted and with it came a new burst of creativity, innovation and energy. Taking a stand for what your body wants and needs can literally be a radical act. I’ve walked the road, and things have changed. Starting the moment you finish reading this article, I challenge you to come back to life -to start listening to the wisdom of your body and take action…to build a single, healthy and sustainable new habit over the next 30 days. I challenge you to carve out a small amount of time at least once a week to put attention on your body, and observe your sensations and feelings, so that you can begin to learn from them rather than fight against them. When you purposefully track the sensations that uplift you-energy, aliveness and joy- new doorways to possibility, personal power and creative potential inevitably begin to open. If you’re not sure how to start, and would like some support, you can join the Just Once a Week 30-Day Embodiment Challenge, starting this week on Friday, March 31, 2017. In it, I will teach you how to get in touch with the wisdom of your body through a series of simple, accessible and low-risk online prompts. Our goal: improved leadership, enhanced relationships and greater resilience. Your mission (should you choose to accept it) begins now. LeeAnn Mallorie, MAPP, MSC is a certified Executive Coach and the Founder of Leading in Motion LLC. LeeAnn specializes in the critical intersection of personal well-being and effective leadership, and has over 12 years of experience helping leaders and organizations achieve great results by truly “walking their talk.” In addition to coaching, she speaks and trains on leadership, resilience, embodiment and purpose. Visit www.leadinginmotion.com to learn more about LeeAnn. There you can download the free guide The Art of Embodied Practice. Follow LeeAnn on Twitter, Facebook, LinkedIn or Instagram. Originally published at https://www.linkedin.com on March 26, 2017.